Whether you like them or dislike them, voice activated assistants have become a standard on smartphones and desktops alike. Essentially what they allow you to do is to control your devices without the need of using your hands, offering a quick alternative of having to type in questions and queries. Before we go into which mobile assistant would be best for you why don't we discuss what each of the top mobile assistants offer? They are in fact all very similar, but some may offer more or alternative functionality to the others. Cortana is available as a core offering on Windows 10 mobile and desktop devices, as well as being able to download it separately onto Android and iOS devices. You can ask Cortana to complete a whole host of tasks for you, such as sending emails, making calls, opening apps, playing music and films and setting reminders and calendar appointments. Cortana also has the capability to learn who you are as a person and your lifestyle opening up a whole host of intelligent features such as; using your location to learn where your home is and where you work office is and at what times that you travel between the two without you having to tell her. With that information Cortana will then notify you as to what time is best to leave in the morning depending what the current traffic is like. If a Cortana enabled mobile phone is paired with a Windows 10 laptop or desktop, any calls or texts received on your smartphone will be displayed on your PC as well. Where Cortana falls short however is that the only option when using the virtual assistant to search for information on the web is that you have to use Microsoft's own "Bing" search engine. You don't have the option to use Google as an alternative. 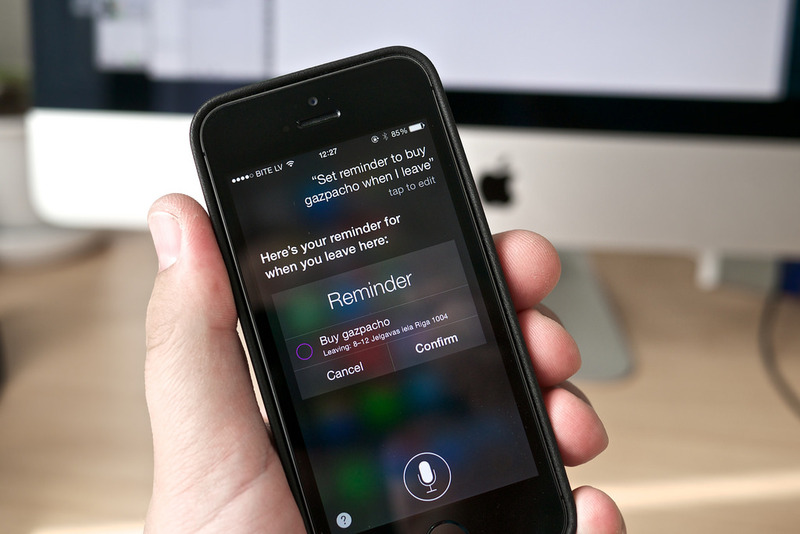 Siri is the virtual assistant that is available on Apple's desktops, laptops and mobile devices. Much like Cortana, Siri enables the user to complete tasks such as setting reminders, making calls and playing music as well as searching the internet. As it currently stands, Siri isn't yet inbuilt to iOS devices, meaning you require an internet connection when even doing localised tasks, such as setting an alarm or calendar appointment. This could prove frustrating where internet connections are poor or inconsistent. It also means that Siri isn't able to provide information before being asked in the way that Cortana does, like telling you when the most appropriate time to leave for work is. Another issue is that Siri only allows you to interact with your voice, there is no way of typing queries to Siri. One of the more recent additions to Siri that Cortana doesn’t yet have is the integration of Apple's HomeKit framework. Allowing you to control smart home devices, which appear to be becoming more and more popular, using your voice. This could be devices such as lighting, door locks, thermostats and various appliances around the house. Siri also uses Google to search the internet as default, but this can be changed to Yahoo or Bing if required. As it currently stands, Google actually have two virtual assistants, Google Now and Google Assistant. Google Assistant is their latest iteration, Google Now is what is currently on most Android phones and can be used on iOS devices as well. Google Now offers the full functionality of Google plus even more. Although it doesn’t quite offer as much as Cortana does, the fact that it utilises Google over Bing means that you are able to get far more extensive search results. As with the other mobile assistants, Google Now allows you to make calls, send emails, set calendar appointments and play music and videos and similar to Apple, have implemented a way of connecting and controlling smart home devices using your voice. This can be done through the smartphone to control Chromecasts, thermostats, lights and more, but this is where Google Assistant starts to creep in to the equation. Google Assistant is very similar to Google Now, but starts to take it to a new level. Google Assistant is already available on the new Pixel smartphones and via the Google Home wireless speaker, providing you with all of the functionality of Google Now, but in a friendlier, more conversational interface. Google Assistant remembers previous questions that you ask meaning you don't have to provide a full follow-up questions to follow, for example, when asking "What time is it in Shanghai?" you can follow the question with "Is it raining there?". Google Assistant starts to bring in an element of Artificial Intelligence as well in the form of learning who you are, such as your birthday, favourite colour, favourite breed of dog, etc. Google's hopes with this type of learning are that far higher functionality will be opened up to the use, for example, instead of just scheduling an event in your diary, Google Assistant will be able to plan the whole event for you. Amazon Alexa is slightly different from all of the above. The way that it differs as that currently, Alexa isn't available as an app or inbuilt to any smartphones or devices. Alexa is actually built in to their own range of wireless Smart Speakers, the Echo, Echo Dot and Tap, which you may have seen popping up all over your social channels and the web. Amazon have actually been incredibly clever with this approach. The speaker itself pairs up to your wireless network at home, and allows you to ask it questions about anything and everything. The fact that Alexa is built into the speaker makes it easier to work across a multitude of Windows, Google and Apple systems and isn't just focused on one. You can also pair Alexa with you Amazon account, and if you need to order something online, just tell Alexa to order it for you. The fact that Alexa is voice activated only, means that it can make it difficult to get a full picture. The likes of Siri, Google Now/Assistant and Cortana provide you with a visual interpretation of your search as well as speaking it back to you. Whereas with Alexa, you may unknowingly not be getting the full information that is required. Similar to Google Assistant, Amazon has included some clever AI style learning, where Alexa is able to remember key information about you and you are able to provide follow up questions without the full context required. Alexa is also capable of connecting up to your smart home devices to control heating, lighting, locks, etc. The final issue with Alexa, is that it is only accessible where the speaker (or speakers) are place, usually in your own home. When out and about you lose your personal assistant, whereas with the alternative virtual assistants on mobile devices you can have them at hand wherever you may be. Which Virtual Assistant is best for me? As you can see, there are a number of virtual assistants that exist for mobile devices and there are more as well such as Samsung's own 'S Voice' on their Galaxy smartphones and tablets. When it comes to choosing one that works best for you however, there are a number of factors that you would need to consider. If you predominantly use a Windows smartphone, then really your only option is to choose Cortana as your virtual assistant. Google Now and Siri aren't compatible in any way with Windows Mobile devices. This isn't necessarily a bad thing however as Cortana looks to offer the most functionality over the alternatives. The main ones being the ability to type search queries and associate reminders with contacts and location, not just a time and date. However the fact that is uses Bing and only Bing for web search queries makes the interface somewhat clunky. Cortana has the potential to be fantastic, but the lack of integration with Google is what seems to put most off. When it comes to using an Android smartphone instead, then you have the choice of using Google Now (soon to be Google Assistant) built in to the platform itself or the option to download Cortana as an alternative instead. As discussed, Google Now works fantastically well and we have high hopes for Google Assistant going forward. You have Google right at the heart of the device and because of this, Googles own virtual assistant starts to learn things about you very quickly and tailor results more specifically to you. Downloading Cortana means transitioning over to Bing as your web search engine, and you start to lose that full integration of Google within your device. Because Cortana is a separate application it's a bit more cumbersome to use and doesn't link well with your Google Calendar, Drive, Photos, YouTube or any other Google app that you use on your device. And then there's your Apple iOS smartphones with Siri implemented within. Again, you have the option of installing Cortana as a separate entity, but it hinders the integration of your smartphone in the same way as it does with Android phones. Siri works well because it is part of the operating system, Cortana you are adding as an addition to it. Simple things such as holding the home button to open Siri, can't be set as the default with Cortana, meaning you are required to open the app manually before you are able to interact with the virtual assistant, adding additional steps that just aren't needed. And finally Alexa, which isn't smartphone specific, but works without the need of a smartphone at all. It works brilliantly when linking up to smart devices in your own home and offers very similar functions to the alternative mobile virtual assistants, but without the ability to see results at the same time as hearing them can make it difficult to get all of the information you require. If it's a virtual assistant you are looking to provide you with information and control devices from within your own home then Alexa is great, but if it's an assistant you are looking for that will help you keep your life organised and up to date whilst on the move, then a mobile virtual assistant may be the better choice. In summary, choosing a virtual assistant really comes down to the device that you use. For the moment, it seems to be that the best choice to make is to use the assistant that comes pre-installed on your device; Cortana for Windows, Google Now and Assistant for Android and Siri for Apple as they are made to work so well with the platform that you use. But it may be worth trying the alternatives that are available. If you use a Windows 10 PC then it may be the better option to install Cortana onto your non Window mobile devices as well. Try what is available and you will find one that works best for you.